Performing an emergency appendectomy? Then DELETE this (in fact, why are you looking at your phone?). If you are NOT, please don’t do ANYTHING ELSE except GET THIS before we sell out (it is 65% OFF!!) --- tons of deets below but let us just say this is a MAJOR coup for our Sinnet label --- a killer 2016 blend from a, shall we say, full on rockstar winemaking legend… oh, just trust us, get some - then come back and read the odyssey that is this delish wine. Back in the day, some of you may remember Casey Flat Ranch. This winery pulled the plug, and we loved the wines so much we bought every single barrel they had, created a wine label (Sinnet) and then hired a Tom Cruise-level top gun hotshot winemaker to help us blend it and finish it. It was one of our best scores EVAH. Well, it is BACK, baby. 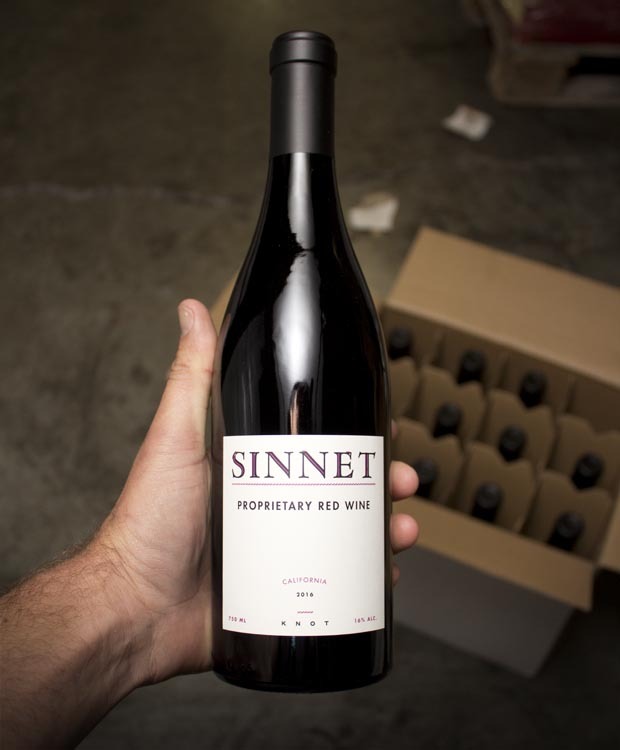 We found another worthy batch of rip-roaring red wine (rockstar winemaker makes the wine, then winery pulls plug on the label) and are stoked to unleash another Sinnet (same wine, our label)!!! 65% LESS than you would pay from the winery! Trust your happily besotted wine merchant --- this is a killer-diller deal with terrific pedigree. Our hands are sore from signing so many non-disclosure documents, however! And so HERE IT IS, oh yes, in all of its lush, ripe, savory complexity and breathtaking, wondrous pricing. The blend is 47% Grenache, 48% Tempranillo, and 5% Carignan (75 year-old vines). So what's it like?? Well, we can’t tell you who made it (but you’ve most likely bought and loved their wines from us or elsewhere before…) but the general profile is rich, forward, juicy, instant-pleasure. They have gotten heaps of great scores over the years. This wine is PURPLE! The nose and palate are all purple-blueness perfume, mint and dark cocoa. Then you sip and WHAM! --- juicy, concentrated liqueur sweetness, pie crust and vanilla bean, not heavy but rich and spicy and even spicy on the finish. SUCH a COLOSSAL no-brainer at this price with this pedigree!! GO, go, go before it’s gone!